Just Be is one of the best books I have read on the subject of consciousness and spiritual awakening. Suresh Ramaswamy helps readers rediscover the hidden light they carry within and the secret to transforming every area of their life by mastering the innate laws of being. 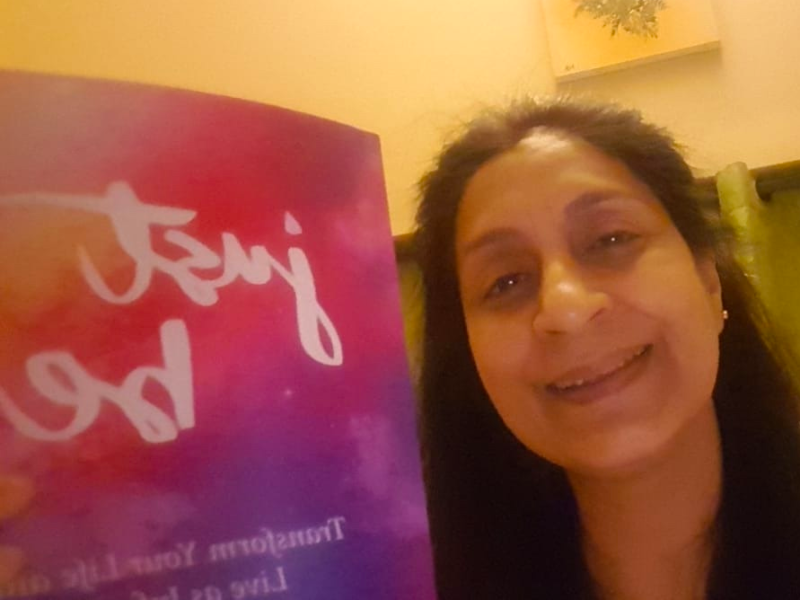 The book is filled with insight and practices that will help readers connect deeply with themselves, understand the core principle of beingness, and use it to transform their lives from within. The writing is filled with symbolic language, but it is very accessible. The ideas are so logically developed and the progression is well structured to help readers follow the inner journey to light with relative ease. If you were to read one spiritual book this year, let this be it! A rare gem filled with wonderful truths and insight. Just Be is a self help book that opens a reader up to the prospect of an expanded reality and self, resulting in greater fulfillment within the earthly life while on a path to infinite living. The book is broken down into three distinct and comprehensive parts: Part I: The Landscape, Part II: The Way Out, and Part III: Living As Infinity – each part contributing to a phase of transformation on the journey to infinity. From the smallest of transitions, such as controlled breathing, to some of the more advanced techniques to a state of consciousness called Oneness, Ramaswamy guides in practical and applicable steps in this well-written and enlightening book. The first thing I was relieved to find when I first opened Just Be is that Suresh Ramaswamy writes in a manner that feels neither preachy nor judgmental in any way at all. The voice is confident and scholarly without being domineering, and the message (which is spiritual as opposed to being religious) comes from a place of absolute warmth and endearment…evident through the care Ramaswamy pours onto each page. The meditative exercises are fantastic even if the scope of the text takes more time to absorb. I’ve returned back to the book multiple times since completing it and continue to learn from it. The process might be slow, but as the end game is to live as infinity, time languidly evolves from something we lack, transforming—like everything else—into a beautiful and boundless continuum. Sublime and substantive pathway to a life worth living. Just Be is a journey of science and spirit full of accessible and effective practices to enrich and enliven every aspect of our time here on earth. Just Be is a beautifully written book that invites a wider perspective of just about everything. Masterful. Recommended read for all Mankind.. A Masterpiece..
Suresh’s Just Be is a wonderful compilation from the author’s Heart. 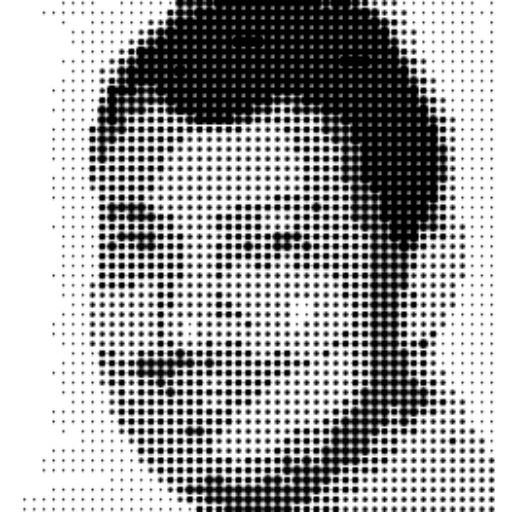 It inspires the readers to the possibility of Infinity. It is very practical. It is a book born out of the author’s personal experiences, inspirations and experiments. I can personally attest to the potency of the “Paperball Release Technique” for discharging troubling emotions mentioned in chapter 4 of the book. A recommended read for all Mankind.. An Invaluable Gem… A Masterpiece..
For anyone on the path of personal transformation and growth, this book is a must-read. It offers practical strategies and profound insights that lead us back to the essence of who we really are and what it means to live from a place of Beingness. I love this book and recommend it to anyone who is looking for transformation from within. Uplifting and inspirational, I find myself reading it again and again. Just Be radiates light and love. 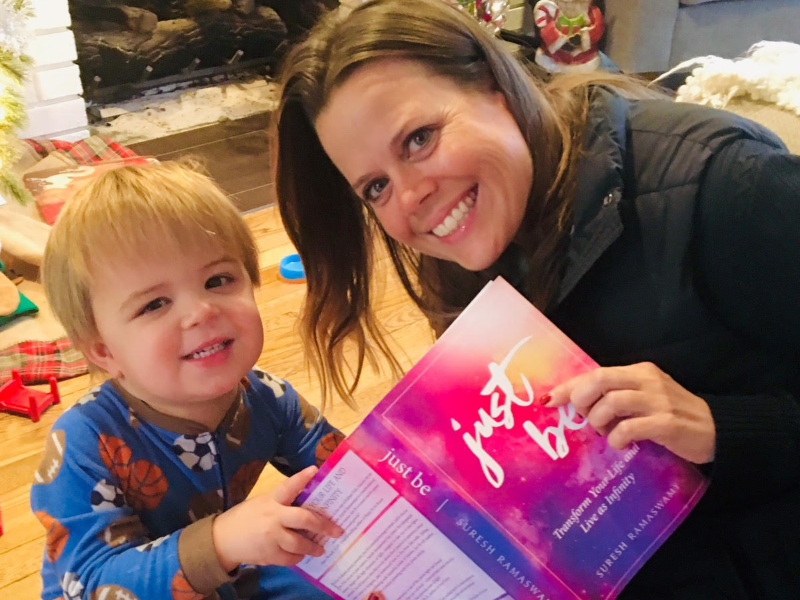 Just Be is a book for all seasons and all reasons… the only book you need to read for 2019. You could be carefree in the comforts of life and find great inspiration from the enlightened thoughts within. Or you may be, as I am, troubled by the stresses and tumult of worldly cares and seeking ways to make sense of it all. This book is both light and heavy. Written in Suresh’s natural speaking style, it flows with ease. His grace and love are evident in the clarity of presentation. It’s paradoxically heavy to me because of the depths that these ideas touch and sometimes it’s necessary to pause, to allow the feelings to develop from the enormous impact of what first appears to be simple words and ideas. What I found in the first chapter alone gives me great hope for finding inner peace and acceptance of the nature of life’s struggles. Beyond that too, openings for inner truths to emerge. Unlike many or most other approaches to inner peace, Just Be is both independent of AND compatible with religion. Whether you’re of a godly faith, agnostic or fiercely atheistic, the strategies and thoughts presented can happily coexist and greatly enhance your beliefs. More importantly, Suresh’s insights and cues to Being are orthogonal to any system of religion or secular thought you may hold and will enhance your prayer, mindfulness, and/or meditation practices. In parts of certain chapters, I can almost hear the related Sanskrit verses that would relate to the principles underlying his approach. At others, the Dalai Lama’s teachings sing alongside in harmony, and certainly there is the truth of the Abrahamic faiths throughout. So very significantly, you’ll not find any mention of Spirit, spirit, soul, or God. It’s totally up to the reader to align these concepts with the contents. Thus, the book transcends religiosity, culture, and ethnic influences. Finally, my recommendation for you is to read the book linearly. Don’t skip chapters; each builds on the preceding. Go through each exercise, even if you feel the resistance. That is when you need it the most! 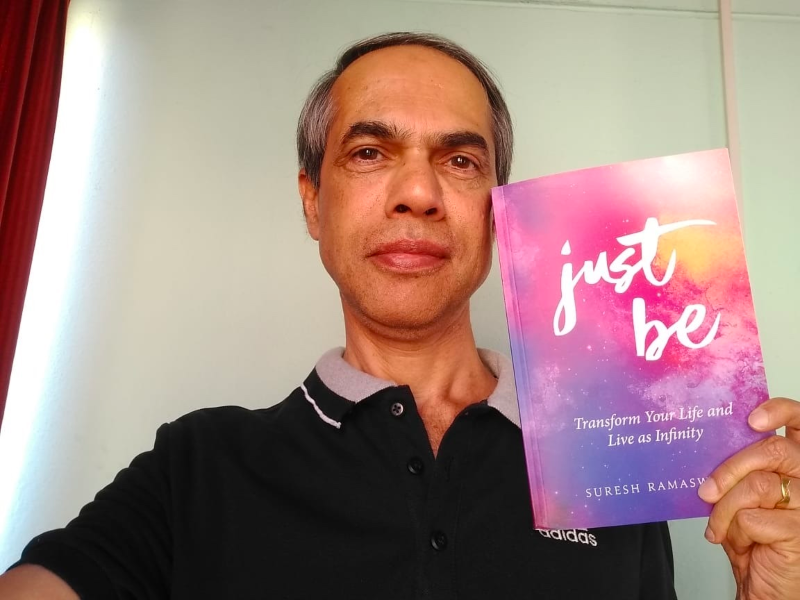 Suresh Ramaswamy’s Just Be is a timeless trove of wisdom wrapped in inspiration, pure consciousness, and the most pristine kind of love. Every word rings with truth, guiding us on an enthralling and life-changing expedition to discover our true essence. Revelatory and transfixing, prepare for the exceptional! Just Be extensively covers subject matter applicable to personal growth enthusiasts and spiritual seekers. Each chapter has much to offer. This is the kind of book you will want to come back to, again and again. If you are serious about transformation, Just Be is the book for you! Just be not only answers many of your questions, but offers very practical tools for personal growth. With the profound insights in this book, you will discover that what you have been looking outside is in reality within you. Just Be’s message and practices are for everyone. Timely and worth every penny. Highly recommended! Just be simplifies spirituality for common people with a rational (scientific) mind and at the same time provides the highest truth and wisdom to be experienced by the reader directly. 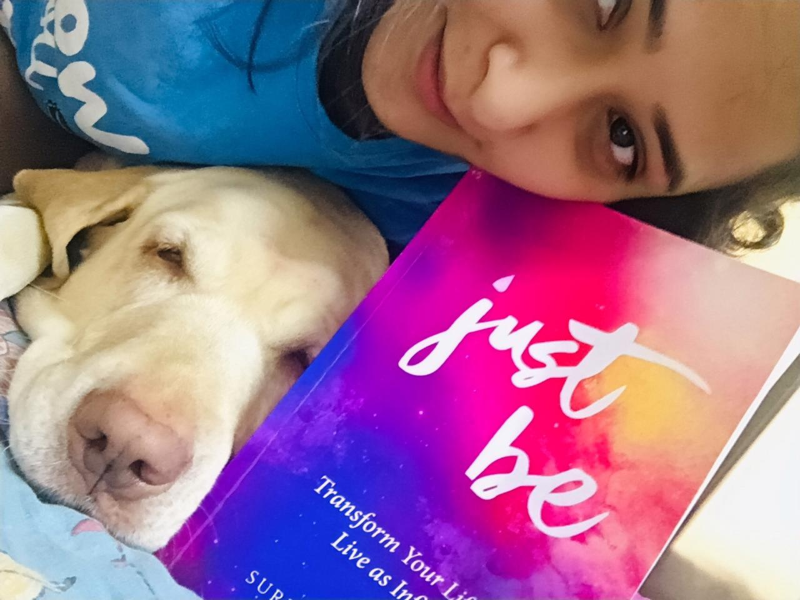 Send us your photo with Just Be. We would love to include it! The strength of Just Be and its efficacy lies in Suresh Ramaswamy’s inclusiveness of material paired with his bullet-point conciseness of delivery, allowing the general reader a kind of measuring tool with which to track his progress. The author is quick to convey that one cannot truly reduce such transformation to a numerical assessment, but his method does allow one to reassess more clearly what transformative effects result from such a practice. In addition, Ramaswamy is conscientious enough to clarify the wider cosmological context in which this transformation is taking place. While some may find the modern, even somewhat scientific, terms in Just Be to be less evocative than their more traditional forebears, others will find a greater accessibility to the truth resonant in these same terms. And maybe they will find, thereby, a more direct and less obstructed path to the mountain peak of Being. 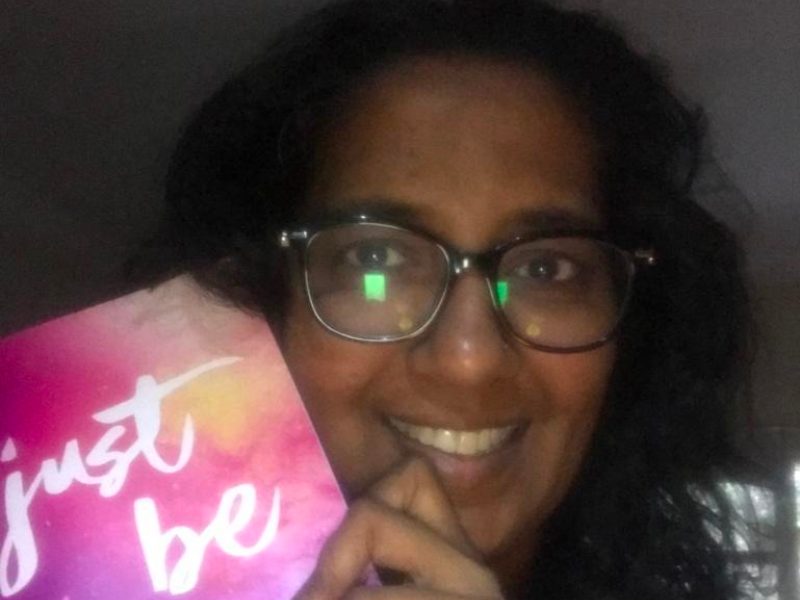 Just Be is a guidebook full of self-help advice, penned by author Suresh Ramaswamy. Described by critics as ‘the ultimate manual for life’, this extensive guide provides spiritual advice and mantras to help its readers seek a wider connection with the world, a more fulfilling life and a true sense of enlightenment. The volume offers tales of wisdom and personal insights from its author, covering such topics as success in relationships, the nature of love, success with peaceful meditation, accepting and knowing your true self, and how to change your life by changing your own personal thoughts and attitude first. In terms of practicality, the guide offers daily practices and real exercises that users can employ daily to lead to their overall transformation. Suresh Ramaswamy writes with great confidence about the possibilities that can be unlocked through this new transformative method, giving advice like a well-informed friend. I found this narrative style to be highly engrossing during the read, and the organization of different sections makes it easy to find the topics that most concern you. The advice within each section contains its own specific exercises, but overall it builds to the same message of transforming your thought processes and wider consciousness of life in order to make the major changes and successes that you desire. It will require regular work to succeed, as with any book of its genre, and I’d recommend Just Be to readers seeking a friendly but extensive guide in this area. Just Be is divided into three sections: The Landscape, The Way Out, and Living as Infinity. The first section addresses our past and our current state of being; it deals with emotions and relationships amongst other things. The second section assists us in understanding how we can exceed our limits. The third section delves deeper into this idea and will help readers integrate Just Be‘s practices into their life. This is a book I would recommend to friends and readers with a cluttered outlook on life. It might bring some clarity. I would also recommend Just Be to readers who love thought-provoking books. It was a pleasure to read.